Edit: I added a water mark. Sorry about that, but I want to be cautious. Please don't reply to bots and scammers in the comments. Another button design for BABSCon! I'v designed Applejack and Fluttershy to go on hexagonal buttons. Twilight and Rainbow Dash are on triangular ones, and Pinkie Pie and Rarity will most likely be on pentagrams. They should make for interesting, unique pins. It's really interesting to see so simple yet amazing drawing by such a great artist! I put white patched on everything. AJ is my favorite!... 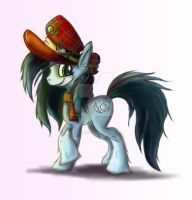 'course, Renna Ranger pony is a distant cousin of Applejack... not sure if she'll make it to Babscon though... will see. Both AJ and Twilight are absolutely fantastic designs! Fascinating notion for the shapes of their pins, can't wait to see how they look...! I'll upload a picture when I get my stock in. I like giving ponies white patches. :3. My Rarity has them, for peat sakes. The white pony has witter bits. oh my goodness, this is such a cute AJ design!! Just curious, but are these only going to be buttons (that’s totally fine) or will there be sticker versions? I wasn't planning on making stickers at this time, mainly because the con doesn't allow them. They kept having people abuse them and leave them all over the hotel, so they banned selling them. I may make stickers of these on my own at some point, but other things come first. Ah that’s too bad they banned them, and that those people abused that. But ok, thanks for answering! Buttons are great regardless!